When M.2 PCIe solid state drives get too hot, they can throttle performance to help manage thermals. One way around this is to point a fan at the gumstick-sized drive, which is usually sufficient to prevent overheating, though MSI has another solution. It's going to implement a special heatspreader on some future LGA 1151 motherboards. The heatspreader, or M.2 shield as MSI is calling it, is an aluminum slab that covers the motherboard's M.2 2280 slot. It has a hinged design to lift up and offer easy access to the drive, which would also give a view of the thermal padding underneath. When closed on top of an M.2 drive, the padded shield squishes against the NAND flash memory chips to whisk heat away from them and the drive controller. 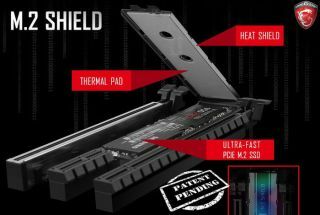 MSI's claim is that its shield lowers temperatures and curbs throttling. Do you need something like this? It really depends on your setup and what drive you have installed. We have seen throttling occur on high performance drives, most notably the Samsung 950 Pro. Under sustained heavy use (mostly writes), performance drops by around 10 percent. In a system with decent airflow, we could see something like this making a difference, at least in theory. In practice? We'll have to wait and see. MSI hasn't said which specific boards will have an M.2 shield, though we suspect it will show up on higher end offerings released around the same time that Kaby Lake shows up on the desktop.